Hi. I'm a Linux newbie trying to install snakeoil-x86_64-0.1.5 on a Mitac PD10RI (Intel DN2800MT3) motherboard. The last output to the LCD screen is "starting web server lighttpd" and then just a black screen. Am I doing something wrong? (23-Mar-2017, 03:35 AM) PSSO Wrote: Hi. I'm a Linux newbie trying to install snakeoil-x86_64-0.1.5 on a Mitac PD10RI (Intel DN2800MT3) motherboard. The last output to the LCD screen is "starting web server lighttpd" and then just a black screen. Am I doing something wrong? Try to ping this machine from another computer by running the following command. If you see a reply from this that means the machine is working and you can start installation. Follow the instructions outlined here: Link. Can you go into your BIOS and change boot from UEFI to BIOS and see if that works? Try connecting your monitor to the onboard HDMI/VGA port instead of your dedicated GPU. Perhaps the ISO don't have support for your GPU. It's a installation from scratch (using Live CD (USB)), so the system is not up and running. I have connected a monitor to the onboard VGA port - same problem. Then I connected a monitor to the onboard HDMI port - again same problem. 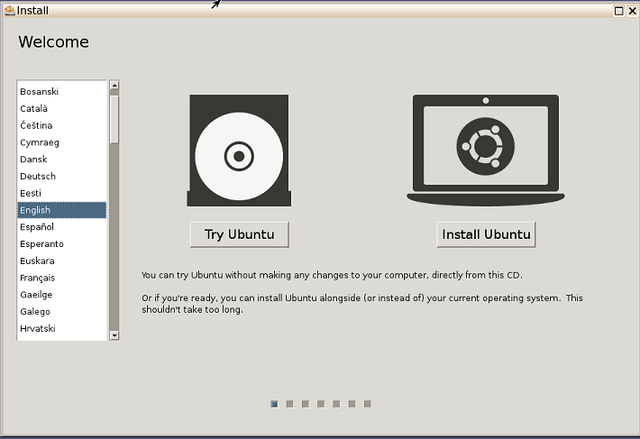 According to the docummenation I should see a Welcome menu where I can choose between "Try Ubuntu" and "Install Ubuntu", but that never happens. Maybe there is a problem with the graphics driver or resulution. Can you ping snakeoil.local from another computer? yes, I can ping snakeoil.local and I can also connect to the web interface. Can I do a installation from the web interface ? (24-Mar-2017, 07:36 AM) PSSO Wrote: yes, I can ping snakeoil.local and I can also connect to the web interface. Can I do a installation from the web interface ? That's good. Yup, you can start the installation from the web interface. Follow the link given in step #1 in the post above to continue your installation. Or if you can, try it out first in LiveCD mode first. LiveCD allows you to test the features without installation, all the settings you've made will not be saved on reboot, so this gives you a non destructive way of trialing Snakeoil. From memory... at the first boot screen click "Tab' where it says "Tab to edit" then add "nomodeset" ,without the quotes, to the end of the boot line and then hit enter to boot. Should workaround the graphics problem and bring you to the screen you want. (24-Mar-2017, 04:34 PM) Bromf Wrote: From memory... at the first boot screen click "Tab' where it says "Tab to edit" then add "nomodeset" ,without the quotes, to the end of the boot line and then hit enter to boot. but still the same problem with the black screen. Don't worry about the black screen as you don't really need that anyway. Snakeoil should still be functional, i.e. you can go to snakeoil.local from your browser, and start playing with it.. And also install via vncviewer. I assume I need this menu to make a non LiveCD installation - is that correct?